MK Stern throws down the gauntlet, declares he will remove his immunity, allowing Rabbi Dov Lior to sue for slander over racism claims. 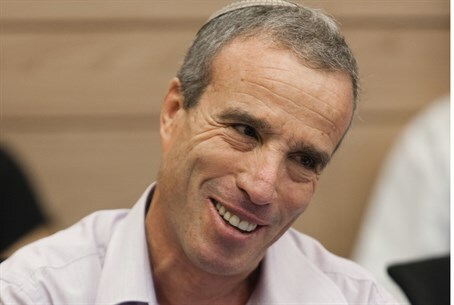 In a dramatic response to his critics, MK Elazar Stern (Hatnua) has declared that he will remove his parliamentary immunity and allow Rabbi Dov Lior to sue him for slander. Stern was widely criticized in the religious-Zionist community after accusing Rabbi Lior of racism against Ethiopian Jews. Rabbi Lior’s supporters said the accusation was completely unfounded, and accused Stern of libel. “I’m rescinding my immunity. Let Rabbi Dov Lior come sue me,” Stern told IDF Radio (Galei Tzahal). “I’ll happily face him in court, over this racism and many other incidents of racism,” he added. The affair began when Stern told the Knesset that Rabbi Dov Lior does not believe Ethiopian Israelis are Jewish, and that at a recent Torah class he warned his listeners against marrying them. Rabbi Dov Lior’s supporters say his words were taken out of context. A recent letter from Rabbi Dov Lior’s attorney to MK Stern similarly accused Stern of twisting his words. “If you had taken the time to look into things, you would have found that Rabbi Dov Lior’s position is more complex, and matches that of the Chief Rabbinate of Israel,” wrote attorney Yitzchak Bam. The Chief Rabbinate decided that Ethiopian Jews should undergo a giur l’chumra – a ceremony performed when it is not entirely clear if a person is Jewish or not. Bam warned, “Attributing the statement ‘Ethiopians are not Jews’ to Rabbi Lior constitutes slander in the legal sense, is a violation of ethics for a Knesset member, and morally speaking, incites hate.” He demanded that Stern issue a public apology. Pressure on Stern moved up another notch this weekend with the publication of a petition signed by more than 100 rabbis from across the country. “Rabbi Lior never said the things that MK Stern attributed to him, and [Stern’s] statements are complete lies… We demand that MK Stern apologize for what he said,” the petition stated. The petition also included a request to strip Stern of his immunity in order to allow him to be prosecuted for slander. “MKs’ immunity is not meant to allow them to slander the good name of any Israeli citizen they choose, and certainly not that of a Torah scholar, public figure, rabbi and teacher,” it read.